I will be writing a few thoughts each week as we travel through football season 2013. I will focus on the West Central Heat. I have become more involved with West Central football over the last two seasons because of my sons who have worked for West Central. West Central Heat I was told, they were described to new staff as buff Davis and bearded Davis. I do love high school football. I love the good part; I try to not contribute to the bad part. The good part is watching a group of young men work hard before and during a season to become a team. The bad part: sideline carping, occasional fights and feuds, distraction from a school's real purpose, and injuries. I hate to see any player get a serious injury. Often my sons have asked me what high school football was like in the days before helmets, they can be very amusing, at least to themselves. Now my time was before playoffs and our area's declining student age populations. We are now in an era of consolidation and coops which causes everyone to be confused over the opponent's name. Mid-county ? What county, mid way to to where? Yes, my days were the Bi-County Conference: Media Bulldogs, Stronghurst Trojans, Union Yanks, Roosevelt Military Academy Roughriders, Yorkwood Golden Bears, Warren Warriors, Roseville Panthers. Other teams we played not always in the conference were the Alexis Cardinals, Avon Trojans, Valley Vikings, LaHarpe Eagles, and the Northwestern Huskies. Many of those schools were consolidations, so really the trend simply continues. We did have helmets. I currently live in Elmwood and my sons went to school here. Occasional information about the Elmwood/Brimfield Trojans E/B Trojans and the Prairieland Conference may slip in. West Central plays in the Lincoln Trail Conference. Both conferences were part of the West Prairie Trail conference for four years before breaking into the current conferences. I created and updated the WestPrairieTrail.org web site during it's existence. Two schools will coop in 2014; West Prairie (Northwestern-Colchester) is in the LTC and Bushnell-Prairie City is in the Prairieland. This coop and other factors will cause some cross conference games to be scheduled in 2014. The Lincoln Trial conference extends from the Mississippi River with Henderson and Mercer County to east of the Illinois River with the River Valley Coop which includes Henry, Lacon, and Varna Living in Elmwood is more centrally located to most of the away games than West Central so the drive is not so bad, and I know all the back roads and shortcuts. Bring on 2013. Mercer County (Aledo Westmer) won the state championship in 2A last year, several LTC teams made it into the playoffs. 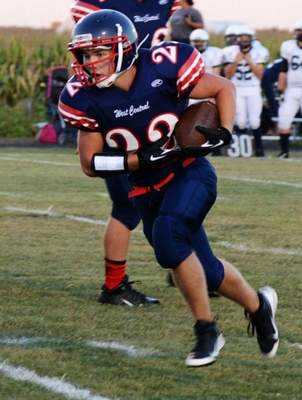 West Central won five games in the 2012 regular season earning the school's first playoff berth. High school football changes personnel with great seniors moving on each year, but the beginnings of some good teams were left to build on from the 2012 LTC season. Besides Mercer County, Annawan/Wethersfield, and Stark County are placed a top pre-season predictions as the teams to beat. WestCentral will travel to play the RiverValley Falcons on Friday night. Go to Lacon go east to Midland High School. A sophomore stood out and single handedly kept River Valley in the game two years ago. He will be a senior this year, I expect West Central will have to focus on stopping Hecke from leading the Falcons to a win this year. West Central entered the season looking a for new quarterback to replace Trey Goff who graduated along some great players over the last two seasons. Friday night will be the first test for new players to operate the West Central option offense. Plenty of heat this week to fire up the Heat for Friday, so drive over and the support the team. Enjoy the 2013 season. The football season started on a very hot night a week ago, it did not feel like football weather. West Central traveled to play the River Valley coop. 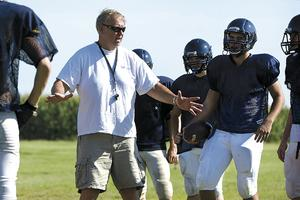 Galen Noard who coached at Roseville and Union is in his third year as coach of the River Valley Falcons. The largest football program in the Lincoln Trail a 3A school, if they make the playoffs which is a real possibility for this year’s Falcon squad. The West Central Heat started off sluggish on defense but showed the ability to move the ball on the offensive side of the game. Junior Justin Alberts started his first game as the varsity quarterback. He was very impressive, the running of Tommy Lewis demonstrated the Heat are going to put up some big numbers on the offensive stats. The defense really picked up as the game got going. They did a tremendous job upfront by shutting down the Falcon ground game. West Central looks to be a good team with a lot to learn, inexperience did show through to really undermine an overall good effort. River Valley reminds me of a Peoria Heights, team several seasons ago. A football program that would fit well in the LTC, if we are shaking up the conferences again. Peoria Heights perennially gets shellacked as they did last Friday night, losing to Elmwood Brimfield, 56 to 0, down 49 to 0 at half. The Peoria Heights team made the play offs that year; a class of players started out and stayed together. They started varsity as sophomores and freshmen and by the time they were seniors the Patriots usually doormats went to the playoffs. The Falcons have a very good corps of seniors QB/DB Miller, RB/LB Helle (my Methodist sensibilities must have gotten the better of me last week, without being able to verify I remembered his name as Hecke) Lewandowski WR/LB, Bodie OL/DL plus others. The Falcons passed for some big yards. Also the Heat in containing other runners allowed the QB Miller to make some big runs when WC containment failed. 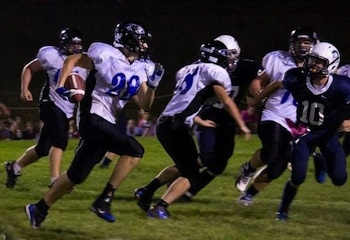 River Valley will definitely win five games possibly six this season. West Central fell behind but pulled themselves back into the game. The Heat played a tremendous third quarter. QB Alberts ran for a TD narrowing the score to 24 to 20. Alberts was injured on the play and did not return. The momentum was on the Heat side, the Falcon running game was shutdown, but the Falcons were able to pass for a key first down and then score turning the Mo the other way. Two almost plays will haunt West Central. A Lewis run for a long TD, but a push in the back 20 yards behind the ball carrier brought it back, and with time expired in the first half a WC runner made it to the 1 yard line but not across it. Hopefully the two injured players will be back. The Heat showed the ability to play some exciting football this season. This week’s game is at Aledo on the newly redesigned George Pratt Field. Mercer County is the returning 2A state champion. They may have graduated players and have some inexperience as the Heat do, but they are always a very good team. Everyone’s favorite to win the conference. If WC turn their third quarter performance into all four quarters the Heat will give the Golden Eagles a good game. Starting with my last line from last week, “If WC turn their third quarter performance into all four quarters the Heat will give the Golden Eagles a good game.” I think most in the LTC football community thought I was just being all rah rah for the home team. When a team meets up with the reigning 2A state champion from a legendary football program the predictions of a running clock in the first half, should be expected. The Heat football team did not accept these dire predictions; they went to Aledo and played a great game. Junior QB Alberts was forced to sit out the Mercer County game as a concussion preventive. The Heat were forced to adjust. The credit to the WC defense cannot be overstated. They held the Golden Eagles to a single touchdown in the first half. They played the entire game defending their half of the field. The one offensive highlight in the first half a pass completion from near their own goal line to the 30 was then fumbled. MC recovered it, and it was like a short punt. The Heat defense continued to play tenaciously. Those on the Heat sideline believed the Mercer County player stepped out of bounds before recovering the fumble. He would have been ineligible to recover the ball. I was yet to arrive having too many duties at Elmwood’s Fall Festival. I can therefore not deliver my authoritative from on high truth on this issue. Even I cannot correct the referees while listening on the radio. I am afraid the cloggers are to blame. I had to get sound system set up for them before leaving for Aledo. The call went MC’s way whether it should have or not, will remain a debate. OK that was last week no team ever played well dwelling on the past or looking ahead on the schedule. Ridgewood comes to West Central High School Friday night. It will be the home opener for West Central. Ridgewood played well last year at Alwood, but the Heat carried away the victory. Ridgewood is Cambridge and Alwood in case you’re wondering about who the school is. Ridgewood has two losses. They have lost to Mercer County and Annawan/Wethersfield; the two best teams in the LTC. This is in my opinion Stark County would object. Stark County can make their objection Friday night as Annawan/Wethersfield hosts Stark County in Kewanee. Two 2 and 0 teams meeting in the third week of the season. The Heat could walk away victors Friday; it is my prediction. 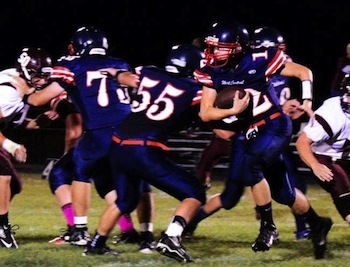 Ridgewood has played two top teams, and the Spartans will be eager to pick up their first win. Hopefully the Heat will be healthy, and give this game the concentrated team effort they did last week. It should be a good game to watch. I have seen outstanding play from this year’s team, so far. Fans will be happy with the weather even if it would deliver a little much needed rain. If you are in Henderson County or near there, show up for a great celebration of your community. “The thrill of victory and the agony of defeat.” You have all heard that line and can picture the poor ski jumper tumbling down the jump, but maybe you are not that old. If you are as old as me, and few are, you will remember it, well. Ridgewood came away with the thrill of victory, and it was certainly an agonizing loss for West Central. The Heat led for the whole game; the whole game if you forget the last 36 seconds. Following a pass interference call in the end zone. Ridgewood was given a first down just outside of the goal line. Ridgewood ran the ball in from the nine yard line. Even then it took a game saving tackle on the Ridgewood 25 to prevent a Lewis touchdown on the kick return. It was pass interference calls that allowed Ridgewood to stay in the game in the second half. A victory that could have been, maybe should have been, slipped away. The West Central offense looked good. The offense proved a real threat in getting big yards when gaining the corner on the outside. WC had a 70 yard TD run. Inconsistency became the theme of the second half. WC looked sterling one moment and lackluster the next. Ridgewood deserves credit for keeping in the game and being there at the end still able to pull out a win. Enough about last week Annawan-Wethersfield comes to town, or rather to the junction of US 34 and IL 116/IL 94. 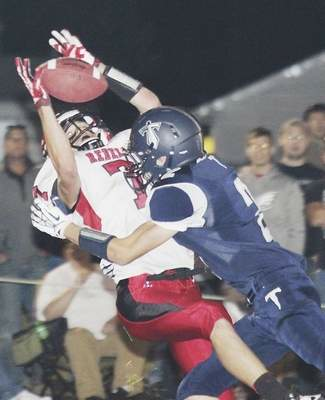 Annawan –Wethersfield lost to Stark County last week, 46-20. Stark County is now gunning for the opportunity to win the conference crown. The showdown will likely happen when they play Mercer County in Aledo on Oct. 4th, unless River Valley pulls off a surprise. 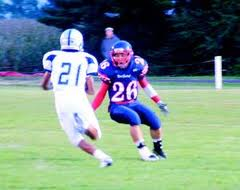 Annawan-Wethersfield had a very good team last year and will undoubtedly come to West Central looking for a win. West Central could surprise the Titans. It will take a 4 quarter effort. I think the defense could stop the Titans. Pass defense has been a weak spot, but hopefully they will acquire fewer penalties on Friday. I would add the stumble in the end zone by the Heat defender did not appear to be interference to me. All the others against WC were correctly called. I think the benefit of the doubt just went the other way on the final Ridgewood pass. Had the Heat played more consistently in the 3rd and 4th quarters, Ridgewood would not have been in a position to win. The Heat can be an explosive team on the offensive side of ball and have been very stingy giving up yards on the ground. Put it all together for an entire 48 minutes and Titans may go home feeling a little smaller. I think at this point in the season, it is time to point out the positives. 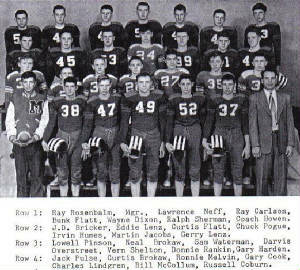 Annawan-Wethersfield was a very good team. They had real size; one 6’4” 300 plus and 6’3” 255 Foster had a lot of quickness, plus several other players in the 210 and 220 range. A/W’s quickest was the 5’10” 155 Trevor Lay. He took the opening kick off back for a touchdown. Lay had a good night as a receiver and defensive back. A/W came to West Central with something to prove after their loss to Stark County in week three. Now it is time to play the current week. Learn from the mistakes that have cost your team two wins that they could have had. I want to point out the high level of play I’ve seen on the defensive and offensive line. West Central has lined up against teams with average size well above their own and played tenaciously. Linemen have to live with the fact people don’t notice them except on penalties. An O line can all but carry the ball across the goal line for a runner, but when the RB crosses the goal behind good blocks untouched everyone will say what a great run. I don’t want to leave anyone out, so I won’t try to name names. The Heat line has impressed me this season both on defense and offense. A line must play as a unit to succeed, so not mentioning individuals is the way it should be. The game Friday night brings Henderson County to Warren County, each district has a few lappers and outliers. I often call it the Bi-County Conference championship game. The two schools now are comprised of six schools that my team played against as opponents; this one game represents 75% of our schedule. The recent games have been close including some real barnburner type plays. Barnburner is a metaphor, not a terrorist act. Friday on East Broadway Extended a rivalry will be renewed. The last meeting at United was a close and thrilling game. West Central needs to come to this game as a team ready for a championship game. The Heat will give United all they can handle, possibly scoring a few points more than the Red Storm when the clock expires. I expect this to be a game worth watching. It almost makes it worth the 50 mile drive for me. I could walk 3 blocks to watch undefeated Elmwood/Brimfield host undefeated Knoxville, but I consider this game a homecoming and wouldn’t want to miss it. Come out and watch a great Forgottonia rivalry. It is the homecoming game this week with the Princes of Princeville coming to West Central. The Heat are still looking for a win. It has been a season where inexperience has cost the Heat the close games. Often in football the turnovers are the game changers; the Heat really outperformed United last Friday night. Key turnovers lead to United coming out the victor 14 to 7 Friday night. This is a week where a pretty good football team needs to find the character to come out and play like winners. It will be difficult; it will be easy to be discouraged. A team psychology can develop that we always find ways to lose; the team needs to develop a psychology of finding opportunities to win. I hope the players have turned the negative experiences to positive lessons. Putting the pieces together Friday and celebrating a win after the clock is done will be a great experience; after a tough season wins are very special. Princeville traditionally likes to get outside on runs. They have often had backs with good speed. I am sure they will pressure the WC defense in containing the outside. Containment requires discipline; a player must concentrate on their assigned role. I believe West Central will be able to move the ball on Princeville. There will be two elements to the game for West Central that will determine the outcome. Can the offense not stop themselves with penalties or turnovers? Can the defense contain the Princes keeping it close? I think both of these goals can be achieved. At the end of this game the Heat can be in the position where they will have an opportunity to win. The first step to turning a season around is to keep the opportunities on your side. I see the Friday night Homecoming game as a great opportunity for the West Central Heat. I was gone last week so I am worried the team will discover I am the Jinx. Throwing salt over my shoulder as I write. Homecoming became the game that a team that had found ways to lose found a path to victory. West Central topped the Princes of Princeville by a score of 9 to 7. The game was tied 7 to 7 in the fourth quarter when the punt snap went over the head of the Princeville punter ending in a safety for West Central. It must have been a great feeling for the team. I was not at the game having travelled to Cornell College for my wife’s class reunion. I began to wonder, as I was glad to hear of the Heat victory, maybe they will ask me to not to come back. Having discovered the jinx, why tempt fate? I will be back, so I am driving up to Oneida for Friday night’s game against Mid County. West Central, having uncapped the magic potion of the being on the winning side of the scoreboard, will not want me messing things up. Although sports fans and players love superstitions, victories come from the overall effort of the team. Those of us cheering, exhorting, and advising have very little to add to victory or defeat. Mid County is a coop of Galva and ROWVA. The Cougars have a record of 2 wins and 4 losses. They will coming off of a 28 to 20 win over Ridgewood. West Central will need to play another complete game, but certainly can keep on the winning side of the ledger. Mid County rolled up over 400 yards of offense last week, so the defense will again be the key. Contain the Cougars keep the game close, and allow the Heat to make a big play. I believe they will come out on top. I am hoping with my fingers crossed, four leaf clover folded securely in my wallet, cap bill flipped up; I don’t wear a cap. I will however try to keep the good luck going. I don’t want to get a reputation as a jinx. Unrelated to West Central but keeping you in the know Elmwood/Brimfield lost to Farmington so three teams in the Prairieland Blue have one loss. Stark County lost to Mercer County in Aledo Friday night so Mercer County is the lone undefeated team remaining in the Lincoln Trail. Annawan/Wethersfield with one loss hosts River Valley also with one loss in Kewanee Friday night. While watching Cornell Rams defeat Beloit College on Saturday, I watch the game while the uninterested alumni chat, I noticed a senior O Line was from Berwick. This caught my eye; I had some teammates from Berwick. Derek Therrien a former Monmouth-Roseville player is the starting left guard. He will return to play close to home on Oct 19th at Knox College. Well, that is all the Henderson County news that isn’t for this week. 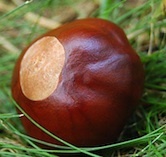 I will be polishing my buckeye the rest of the week. As you turn from US 34 to reach the field in Oneida you can be forced to wait on a train, if want to see the kick off don’t wait until the last minute. If you missed the blog last week, the question may be “Where were you?” I was playing long haul shuttle for my wife. 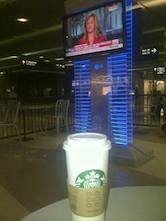 Nancy asked if I would come to O Hare and pick her up after she had missed a flight in Philadelphia. The missed flight meant she could not make the flight from Chicago to Peoria. Airline travel is just so many dominos. Further delays resulted in my going to bed at 4 AM; Thursday became a foggy unproductive day. It is the last week of the regular season, last week for West Central football 2013, last Henderson Hearsay column. Stark County was a very impressive team. They were all but unstoppable for the Heat last Friday night. The West Central team has played very well this season on the defensive side of the ball. Stark County’s downfield blocking by their receiver corps I believe was the key to their long gains. Passes thrown for short distances, many just flares and dunks, turned into huge gains for the Stark County Rebels. West Central QB Alberts suffered a collarbone injury in the game against Mid-County in Oneida. Mize did an admirable job filling in, as he has done at other times this season, but it takes away from the offense’s options against a team requiring all your weapons. West Central did score late in the game employing the hook and ladder to gain the last few yards. The team displayed good cohesion and spirit on a night that was going badly from the start. 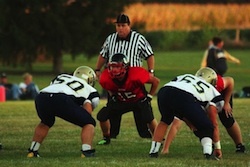 Friday night the West Prairie Cyclones come to West Central for the season’s final game. West Prairie is winless, so will bring a great desire to not end another season on the aught side of the win column. Next season West Prairie will coop with Bushnell causing Lincoln Trail and Prairieland adjustments. The two schools will hope for better football times; Bushnell-PC is also winless. Come out to support the team on Senior Night, this senior class has some real quality football players they deserve recognition. 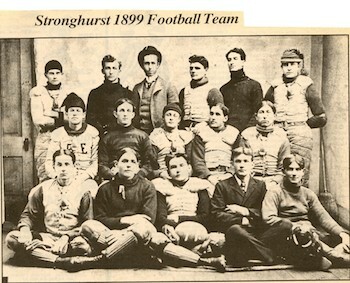 This is last blog so I had a few thoughts to throw in about high school football. Lessons on being a team, lessons to take with you in life. Life after football happens even for the best. I have watched interviews with football greats after their NFL careers are distance memories. They still love the game, they remember their teammates what a connection they had on the field. Sometimes they have carried away lifelong injuries; it is a sacrifice to become a good football player. I wrote about a concussion discussion last year. I urge us all to be honest; to recognize the problems, and be open to the changes required to make the sport safer. As I said in the first blog, injuries are amongst the bad things in football. I want to end talking about the good things. The Stronghurst team we played 70 yeears after this had more players, no one wore a vest or a derby hat, although it would have been prety cool. The take away is to move on to life with lessons learned from football. The most positive lesson of football is the experience of becoming a team. It demonstrates the potential of a group of dedicated people to accomplish good things. Football requires a team, finding everyone’s best role; everyone giving their best effort. This is what makes a good team. I would urge coaches to give everyone a fair shot at being part of the team. Each player is different. One player may need pumped by screaming, but another may excel when asked to play up to a higher level in a quiet voice. 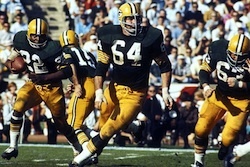 In the HBO special Lombardi a reporter relates how one player said Vince Lombardi treated everyone the same, he treated every player like a dog. The reporter said it wasn’t true, Lombardi treated everyone with the approach that motivated them the best. Which was treating some players like dogs. Successful high school programs get high levels of participation and motivation. It takes more than just going out. Success requires working hard on conditioning through all seasons. I began attending area high school football games after college. I got to watch some successful programs. 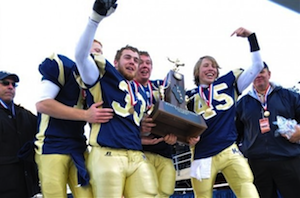 Playoffs were a big change in Illinois high school football. I always thought a key to successful coaches such as, Bavery at Southern and Noard at Roseville, was motivation and participation. They seemed to find a role for everyone. This was my impression as one of the important changes from when I was in high school.Everyone takes a unique lesson from his football experience. Not every lesson is an easy one. My take away was persistence learning to know your self. I know how frustrating it can be for students and coaches. I will relate my story; my last game evened out much of my frustration. It wouldn’t have happened if I had quit. Players should realize no coach is perfect, but they aren’t either. I had a less than perfect relationship with the assistant coach at our school. He had been there a long time was the athletic director, loved track. I only went out for football. I do not know when we started on our path to conflict; I know it wasn’t in the classroom. I will relate the tale at another time, but I had a rather frustrating time during my junior and senior years because of this coach. Many players who could have made a difference for our team didn’t go out at all their senior years. I was ready to quit my senior year, almost did, but I didn’t. We played our last game against LaHarpe for second place. We had lost to Stronghurst 16 to 13 earlier in the season. The Eagles had a star junior QB with a good arm, so they passed a lot. Actually, I had been asked to stand beside the coach to shuttle plays on offense; the first quarter was nearly over we were on defense. I hadn’t been in. Our star defensive tackle got hurt the coach saw me and sent me in. Yes, we were playing with a six man defensive line, even against a passing team. I got to the QB tackled him. I was flagged for a 15-yard penalty, not a good start. I got back to him again the following play, he still had the ball but I held up, so a hurry. I played the rest of the night on the defensive line; after the tackle came back I was moved to interior guard. LaHarpe wanted to pass; I loved rushing the QB. I got two sacks, one where I knocked ball loose and recovered it. LaHarpe punted late in the game. I decided to block my man at the line; I put him on the ground. He got up; I put him on the ground again. He got up. and I put down again, this time as we were getting up he kicked me in the head. As you may remember, even as long ago as I played we did have helmets. I was unaffected, but we did get those 15 yards back. After all the frustration I had a great closing night against a good team. I didn’t regret staying out, even through the frustration. I have learned much from football, I know reaching out to get everyone’s input makes a project more likely to succeed. I hope every football player gains an appreciation for hard work and teamwork. These are qualities that will carry anyone a long ways in life. I will be in Omaha this week, a required spouse appearance for my wife’s company’s 100th anniversary celebration. I wish the team well Friday night. I would urge everyone at West Central to encourage all the underclassmen for next year; numbers and hard work in the off-season do make successful football programs.